Golf: Nick O’Hern took advantage of calm morning conditions as one of the first players off the tee Thursday to shoot a 7-under-par 65 and take a one-stroke lead over Chris Riley in the first round of the Reno-Tahoe Open. “Can’t play much better than that,” said O’Hern, who made six of his seven birdies on putts from 10 feet or closer while posting the only bogey-free round of the day at the 7,472-yard Montreux Golf & Country Club in Reno, Nev.
Riley had one bogey in his round of 6-under 66. He’s one of the seven past champions playing in the 13th year of the event on the mountain course designed by Jack Nicklaus. Will MacKenzie, the 2006 champ, was another stroke back at 67 tied for third with Blake Adams and Briny Baird. Former Pullman resident Kirk Triplett was five shots off the lead with a 2-under 70. Spokane native Alex Prugh shot a 73. • Jutanugarn extends lead at Junior PGA: Ariya Jutanugarn of Thailand shot a competitive course record of 6-under 66 at Sycamore Hills Golf Club for a 10-stroke lead heading into the final round of the 36th Junior PGA Championship at Fort Wayne, Ind. She is at 13 under, while Mariah Stackhouse of Riverdale, Ga., is second after shooting 73. 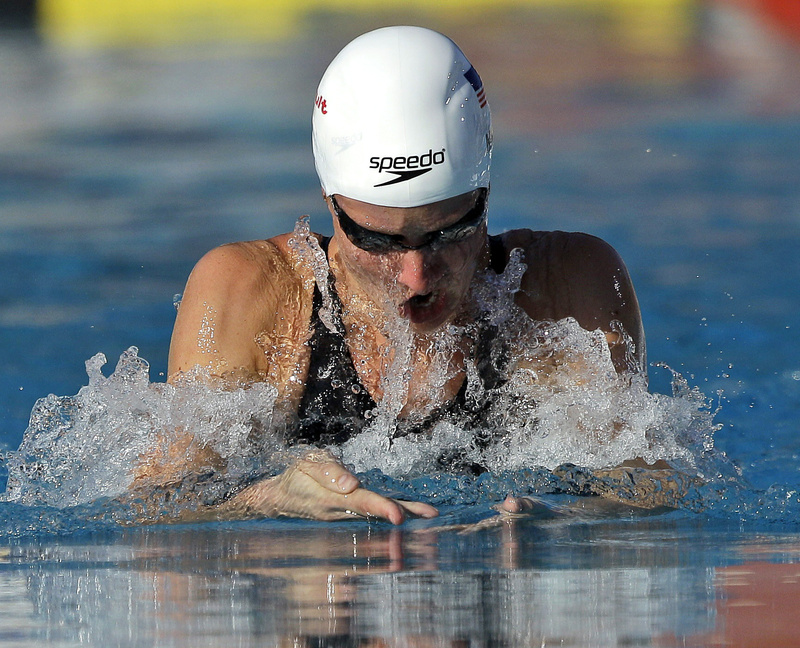 Swimming: Jessica Hardy outraced Ann Chandler over the final lap to win the 100-meter breaststroke at the U.S. national championships in Stanford, Calif.
She touched in 1 minute, 6.81 seconds. Chandler finished at 1:07.17 and Ellyn Baumgardner was third at 1:08.20. Tim Phillips won the 100 butterfly at 51.69, tying for the sixth-fastest time in the world this year. College Football: Oklahoma has been named the preseason No. 1 in the USA Today coaches’ poll. The Sooners received 42 of 59 first-place votes to easily outpoint No. 2 Alabama, which received 13 first-place votes. Oregon, which lost last season’s BCS championship game, is third and LSU is fourth. Oregon and LSU will open the season against each other at Cowboys Stadium on Sept. 3 in Arlington, Texas. They each received two first-place votes in the coaches’ poll. Florida State is fifth, followed by Stanford, Boise State, Oklahoma State, Texas A&M and Wisconsin. Defending national champion Auburn starts the season ranked 19th in the coaches’ poll. • Gunman situation delays Hokies’ practice: Virginia Tech’s first football practice of the preseason was delayed for an hour after reports of a gunman on the campus. No gunman was found despite a massive search of the sprawling Blacksburg, Va., campus. College Basketball: Duke will face Tennessee in the championship round of the EA Sports Maui Invitational, which is undergoing an expansion. Other matchups at the Lahaina (Hawaii) Civic Center on Nov. 21 include Michigan vs. Memphis, UCLA facing host Chaminade and Georgetown playing Kansas. The winners meet in the semifinals on Nov. 22, with the championship game on Nov. 23. Duke has won a record four EA Sports Maui Invitationals. For the first time since the field expanded from four to eight teams in 1986, there will be “regional games” that will include four schools – Towson, North Carolina-Greensboro, Belmont and Middle Tennessee State – which will play games on the mainland beginning Nov. 11 as part of the new 12-team format. • NCAA eyes changes in recruiting: The NCAA’s Leadership Council says, in a release posted on the NCAA’s web site, that it has reached a consensus on several parts of the package to overhaul Division I men’s basketball recruiting. Among possible changes: allowing juniors to begin making official visits after the NCAA championship game is played; deregulating the types of communication allowed between coaches and recruits; allowing unlimited communication after Aug. 1 for soon-to-be juniors and allowing two weekend evaluations during non-school related events in April. Those evaluation periods would have some restrictions. The committee has not signed off on any summer recruiting changes. Miscellany: The legal team for welterweight champion Manny Pacquiao has filed a motion in U.S. District Court in Nevada, for default and dismissal in his defamation lawsuit against Floyd Mayweather Jr.
Pacquiao is accusing Mayweather of defamation after the rival boxer made repeated statements alleging that the Filipino fighter has used performance-enhancing substances. • Wade reportedly offered big paycheck in China: The Chengdu Daily is reporting that Chinese Basketball Association team Zhejiang Guangsha has offered Miami Heat guard Dwyane Wade $2 million per month to play in Hangzhou, where Wade visited last week. • China expels Olympic speedskater: China’s most decorated Winter Olympic athlete, Wang Meng, has been expelled from the country’s short track speedskating squad after a drunken brawl with her team manager on July 24.